Unions and social services directors have warned that the £20.5 billion-a-year NHS funding boost announced by the prime minister today will be worthless if social care is not also given more investment. Theresa May announced the much-anticipated funding increase for the NHS in time for its 70th anniversary next month. This represents a 3.4% increase per year in the annual £114 billion budget for the NHS in England. A total of £3.2 billion has been made available for Scotland and Wales to be spent by their devolved governments. Northern Ireland is in limbo because of political deadlock there. 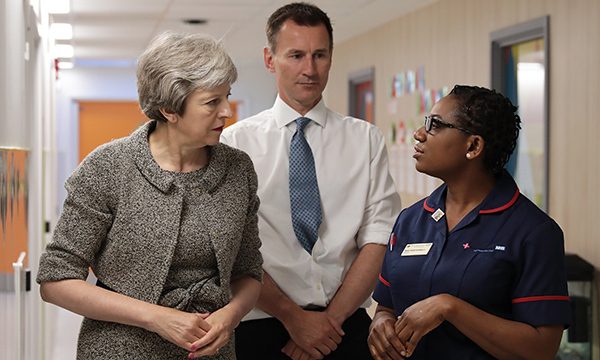 In her speech, Ms May highlighted the challenges the NHS faces as a result of an ageing population as she outlined the government's four-year funding plan. ‘Despite more funding, more doctors and more nurses, and great progress on treatments, our NHS is under strain,’ she said. ‘So, we will do more than simply give the NHS a one-off injection of cash. RCN general secretary Janet Davies responded it would be a mistake for the government to celebrate the NHS announcement while continuing to neglect social care. She said: ‘By Jeremy Hunt’s own admission a few days ago, his government’s social care cuts have piled pressure on hospitals – investing in home care and local community services helps stop hospitals becoming overwhelmed. Ms Davies described the funding boost as enough to sustain the NHS, but insufficient to transform it. ‘The extra funding is a welcome birthday present for the NHS, but we need to make sure there are enough candles on the cake,’ she said. Ms Davies pointed to health economists' concerns that only an increase above 4% would be enough to 'transform the NHS into the service all nurses want'. 'If the PM only gives the health service enough money to jog on the spot, she must not expect great strides forward,' she added. But the RCN did welcome hints that the prime minister wants the NHS to be a more flexible employer. In her speech, Ms May said the NHS must become more attractive to workers. Ms Davies picked up on a passage in the prime minister's speech that pointed to the introduction of nursing associates, adding that the government must make nurse education a ‘top priority with genuine incentives’. Other RCN figures were less optimistic on the funding announcement, with past congress chair Stuart McKenzie stating it would merely drive nurses out of the profession. Association of Directors of Adult Social Services president Glen Garrod criticised the absence of social care funding in Ms May’s announcement. However, health and social care secretary Jeremy Hunt said a long-term social care plan is being formulated. Theresa May has claimed a ‘Brexit dividend’ would partly fund the NHS budget boost. But Institute for Fiscal Studies director Paul Johnson said there would be no windfall from Brexit due to the £39 billion EU ‘divorce bill’ the UK would have to pay. Meanwhile, Commons health and social care committee chair Sarah Wollaston described the idea of a Brexit dividend as 'tosh'. Labour’s shadow health secretary Jonathan Ashworth said the announcement was a ‘failure’ and based on ‘wishful thinking’ that failed to recognise the plight of the social care sector. As part of the announcement, an additional £2 billion in funding has been announced for Scotland and £1.2 billion for Wales. No such arrangements for Northern Ireland where devolved government has broken down. Speaking on BBC Radio 4's Today programme this morning, health and social care secretary Jeremy Hunt said more details on the funding plan will be revealed at the Budget in November. ‘The reason we are not spelling it out now is because we want to give the NHS six months to come up with a really good 10-year plan,’ he said. Mr Hunt also said a long-term plan for social care funding was being prepared. The government’s social care green paper is due to be published in July.